As we embrace this New Year and take the time to find ways to improve ourselves, body and mind; we must invite practices that will build our confidence, strength and stability. This is why I have chosen Navasana (aka boat pose) as the Yoga pose for this month. Navasana is a well known posture for increasing our core strength, and this goes way beyond obtaining flat abs. Our core is the foundation of our beings and if we are not solid and strong in this area, we may lack the proper stability and strength that we need to make the necessary decisions, actions and changes in our day to day life. 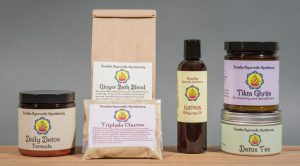 January is also the time when Kapha dosha begins to increase in the environment, and therefore is likely to increase in our body and mind as well. This may cause coldness, heaviness (both physical and mental), congestion, sluggishness, lethargy, low motivation and a foggy-dull mind. In order to balance out these unwanted qualities, we must then bring about practices that contain the opposite qualities as we move through this season. Navasana is a great posture to bring lightness, heat and strength to our being, naturally increasing focus, stamina and energy. According to Ayurveda, Navasana is highly beneficial to Kapha dosha as it promotes heat, circulation, digestion and focus. This posture is also beneficial for Vata, as it works on the pelvic region, the “home” of Vata dosha. This help reduce gas, bloating and obstruction in this region, while bringing stability, confidence and strength to the practitioner, further reducing the Vata. Pitta types can also practice this posture, although only in moderation, as it can bring healthy energy to the solar plexus region (a main site of Pitta). However, due to the heating nature of this posture, it can increase or disturb Pitta and therefore should not be practiced for those with high Pitta or excessive fire in the body or mind. Main Areas of Strengthening in the Body: Strengthens the entire core area including the abdomen, lower back and solar plexus region. Also strengthens the mind increasing focus, motivation and clarity. Main Organs: The full boat posture (Paripurna Navasana) works mainly on the stomach, kidneys, small intestines and large intestinal region. 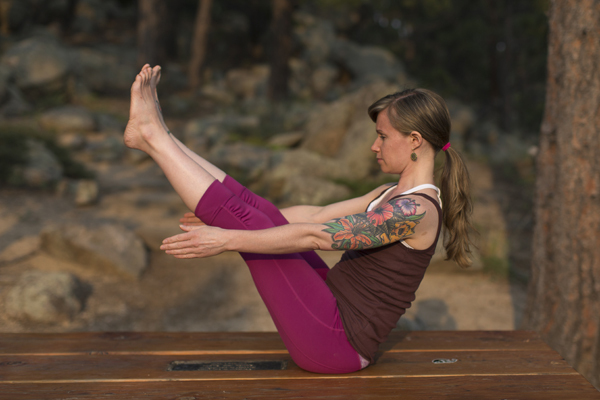 The half boat posture (Ardha Navasana) works more on the liver, spleen and gallbladder meridian. 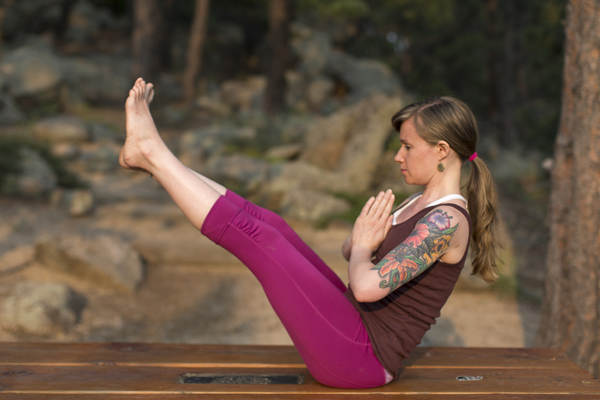 Begin by sitting in Dandasana, or “staff pose”. This posture is done placing the legs directly out in front of you, straight and flat to the ground. Keep the spine erect and at a 90 degree angle from the legs. Place the palms to the floor, beside the hips with the arms straight. The finger tips should be pointing toward the front of the room. This is Dandasana. After a few breathes in Dandasana, exhale the legs up, keeping them straight and in line with each other. Slightly recline the back, keeping the spine straight. The only part of the body that remains touching the ground will be the buttocks. The feet are held slightly higher than the head. Keep the gaze soft and down the tip of the nose. The arms can be straight beside the body at about knee level, palms facing in; or alternatively they can be help in “prayer position”. Take slow, steady breathes here as you feel the body getting warm and the mind increasing focus. For beginners, stay here for 3-5 breaths and slowly bring the legs down, straight and with control, back into Dandasana (see #1). 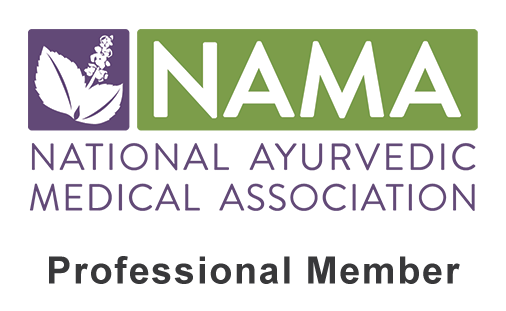 For more advanced practitioners, stay here for at least 30-60 seconds and increase the duration with regular practice. For more Kapha-reducing, heat-building benefits, one can make this a more dynamic practice by adding some movement. To do this, move from Navasana to slowly, simultaneously releasing both the straight legs and straight back to the floor with arms overhead on an inhale. Pause hear and exhale slowly as you float back up with control to Navasana. Perform this 3 times in the beginning, and increase this count to 10 or more. After performing these Navasana “sit-ups”, hold the full Navasana for several breaths before releasing slowly, with control back to the ground into Dandasana or Shavasana. 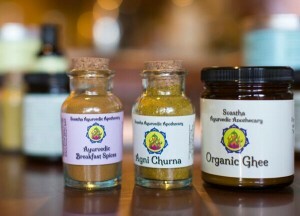 Try our Ayurvedic Detox Kit! Great post!!! These different yoga exercise poses are very helpful. I found this particular blog useful to me. Nice blog Daneue. Yoga is the important part in our life. Now I am also starting yoga in early morning. Keep sharing this kind of stuff.